Part 1 of this series examined the increasing complexity of supply chain processes, the consequence of natural disasters, geopolitical shifts, changing trade policies, and much more. In the face of this reality, enterprises can begin to reimagine the end-to-end procurement process using intelligent technologies to extract data automatically for use in countless ways. And it’s what you do with the data that drives the real value. Intelligent technologies can help procurement professionals analyze data and spot patterns, providing the insights needed to manage complex supply chains, optimize procurement systems, and reduce risk. For example, smart contracts can be embedded with contractual terms. Tools can monitor conditions and create real-time notifications when any operations are noncompliant with contracts or regulations, helping mitigate risk proactively and potentially avoiding fines or monetary penalties. Intelligent spend-management solutions use data-based insight to enhance visibility into all spending and supply chain risk. They can dig down into information about even second- and third-tier suppliers – identifying bad actors, detecting fraud, optimizing payment schedules, and anticipating supply chain disruptions. Process automation reduces or eliminates manual, error-prone tasks. It can also make it easier to access and gain insights from Big Data, wherever it resides, and streamline sourcing and payment activities accordingly. These technologies free procurement experts to do more valuable work, such as determining new policy strategy based on the insights and analysis received. Humans are enabled by machines. Guided buying and persona-based tools help ensure that the right information gets to the right person at the right time. It also improves the user experience for procurement professionals. With built-in intelligence and guided workflows, these technologies make recommendations and deliver proactive alerts. Together, intelligent technologies provide insights that help procurement teams make smarter decisions faster. By harnessing artificial intelligence and machine learning, processes that once took hours or even days can be executed in minutes. Embedding intelligence into procurement processes can help enterprises capitalize on opportunities across the entire source-to-pay process. And by reducing mundane tasks and allowing procurement professionals to do more interesting work, these tools can help people increase their job satisfaction, add more value to the company, and spur innovation. In my opinion, improving job satisfaction is one highly effective way to simplify supply chain complexity. Microsoft introduced contained databases in SQL Server 2012. A contained database is one that is isolated from other databases and from the SQL Server instance that hosts the database. The database maintains much of its own metadata and supports database-level authentication, eliminating the need for server-based logins. As a result, a contained database is more portable than a traditional, non-contained database. It can also simplify database development and administration, as well as make it easier to support Always On Availability Groups. Controlling access to a contained database is similar to a non-contained database, except for a few important differences. 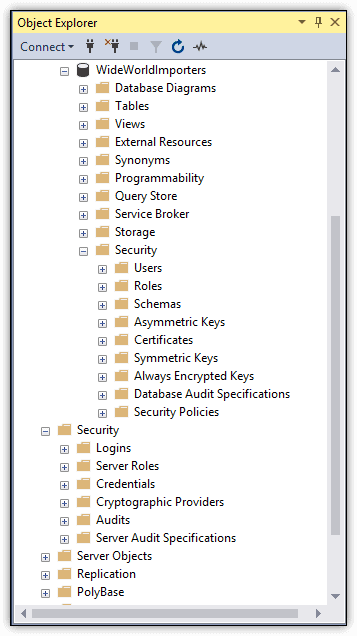 In the first two articles in this series, I touched briefly upon the topic of contained databases when discussing SQL Server access control. In this article, I dig deeper into contained databases and offer several examples that show how to create contained database users, duplicate users across multiple contained databases, and unlink database users from their server-level logins. To try out the examples in this article, you need a test environment that includes a contained database. On my system, I used SQL Server Management Studio (SSMS) to create a simple database and populate it with data from the WideWorldImporters database, although you can use any data that fits your needs. The EXECUTE statement calls the sp_configure stored procedure to set the contained database authentication setting to 1 (on). You should then run the RECONFIGURE statement to implement the changes. When you create a database, you can specify that it should be contained by including the CONTAINMENT clause in the CREATE DATABASE statement and set its value to PARTIAL. The default value is NONE, which disables the contained database feature. The PARTIAL value is used because SQL Server supports only partially contained databases, as opposed to fully contained databases. Currently, SQL Server does not support fully contained databases. A partially contained database allows you to implement uncontained features that cross the database boundary. 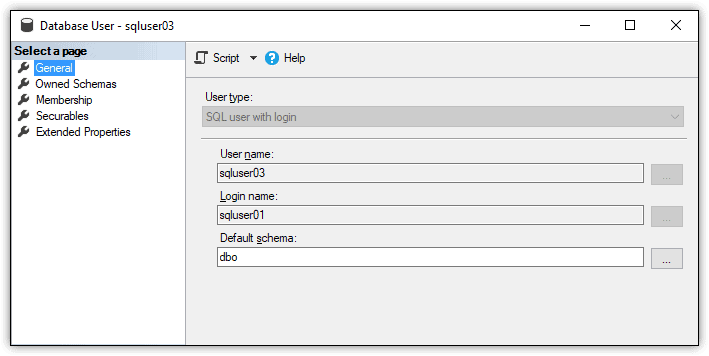 For example, you can create a database user that is linked to a SQL Server login in a partially contained database. Fully contained databases do not allow the use of uncontained features. The script creates the Sales schema, adds the Customers table to the schema, and then populates the table with data from the WideWorldImporters database. The SELECT statement’s WHERE clause limits the results to those rows with a BuyingGroupName value that is NOT NULL (402 rows on my system). If you create a different structure or use different data, be sure to modify the remaining examples as necessary. In SQL Server, you can create users that are specific to a contained database and not linked to server-level logins. Contained users make it possible to maintain the separation between the contained database and the SQL Server instance, so it’s easier to move the database between instances. SQL Server supports two types of contained users: SQL user with password and Windows user. The password-based user is a database user that is assigned a password for authenticating directly to the database. The user is not associated with any Windows accounts. When a password-based user tries to access a contained database, the user account is authenticated at the database level, rather than the server level. In addition, all authorization granted through assigned permissions is limited to the database. The second type of contained database user—Windows user—is based on a Windows account, either local or domain. The Windows computer or Active Directory service authenticates the user and passes an access token onto the database. As with password-based users, authorization also occurs within the database according to how permissions have been granted or denied. When you create a Windows user, be sure that the Windows account is not already associated with a login. If you try to create a Windows user with the same name as a login, SQL Server will automatically associate that user with the login, which means that the user will not be contained. You can also add contained users to fixed and user-defined database roles, and assign permissions to the user-defined roles. For more information about creating database users and granting them permissions, refer back to the second article in this series. When working with contained databases, you might find that some users need to be able to access multiple databases. For password-based users (SQL user with password), you should create the same user in each database, assigning the same password and security identifier (SID) to each user instance. The script creates the ImportSales2 database, adds the Sales schema to the database, adds the Customers table to the schema, and populates the table with 261 rows of data from the WideWorldImporters database. In this case, the WHERE clause filters for NULL values, rather than NOT NULL. That’s all there is to creating duplicate password-based and Windows-based users. You can use the same format for creating duplicate users in additional contained databases, depending on your data access requirements. The problem is not with how you’ve set up the user accounts or query, but rather with how the TRUSTWORTHY database property is configured. The property determines whether the SQL Server instance trusts the database and the contents within it. Although this might seem to have little to do with contained databases, the TRUSTWORTHY property must be set to ON for the ImportSales2 database because you’re running the query within the context of that database but trying to access data in the ImportSales1 database. By default, the TRUSTWORTHY property is set to OFF to reduce certain types of threats. You can find more information about the property in the SQL Server help topic TRUSTWORTHY Database Property. Before setting the property, you must be sure you’re working in the correct execution context. If you’ve been following along with the examples, your session might still be operating within the context of the sqluser02 user. This is because the UNION ALL query in the last example failed, which means that the REVERT statement never ran. As a result, your current SQL Server session is still be running within the execution context of the sqluser02 user. To correct this situation, simply rerun the REVERT statement. I created and ran all the above examples in SSMS. If you try them out for yourselves, you’ll also likely use SSMS or SQL Server Data Tools (SSDT). In the real world, however, most connections will be through third-party scripts, utilities, or applications. In such cases, the connection string that establishes the connection to the contained database must specify that database as the initial catalog. Otherwise the connection will fail. Because SQL Server contained databases are only partially contained, they can include users mapped to server logins. The users might have existed before changing the database to a contained state, or they might have been added after the fact. In either case, the database is less portable because of its login connections. The query should return all the rows from the Customers table in the ImportSales1 database. The @username parameter is the database user. The @rename parameter determines whether to use the database user or the server login for the name. The keep_name value retains the database user name. The copy_login_name uses the login name. The @disablelogin parameter determines whether to disable the login. In this case, the login will not be disabled. To disable the login, instead, specify the disable_login value. After you run the EXECUTE statement, reopen the properties for the sqluser03 user. 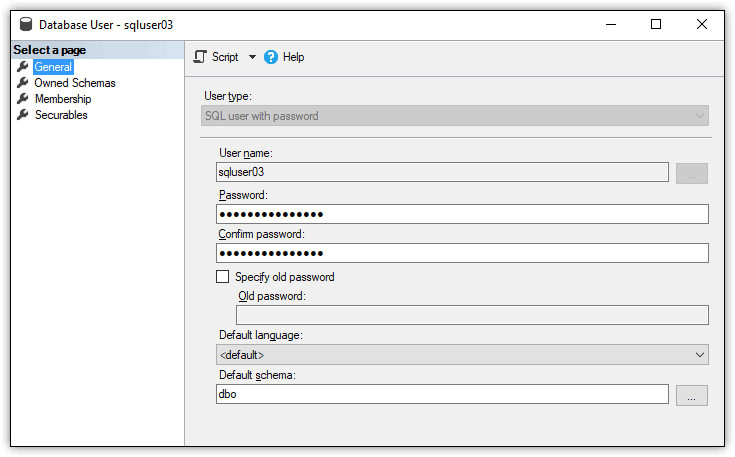 You’ll find that a login is no longer associated with the user and that the user type has been changed to SQL user with password, as shown in Figure 2. By unlinking the login from the database user, you can take full advantage of the portability inherent in contained databases. Be aware, however, that the sp_migrate_user_to_contained stored procedure works only for SQL Server logins and not Windows logins. Contained databases can make it easier to move a database from one SQL Server instance to another, without having to worry about duplicating login information between those instances. However, before implementing contained databases, you should be familiar with Microsoft’s security guidelines, described in the SQL Server help topic Security Best Practices with Contained Databases. The topic explains some of the subtler aspects of controlling access to contained databases, particularly when it comes to roles and permissions. Aside from these guidelines, you’ll find that controlling access to a contained database works much like a non-contained database. You might need to duplicate users across multiple contained databases or unlink database users from their server logins, but these are relatively straightforward processes, much like controlling access in general. Once you understand the basics, you should have little trouble supporting more complex scenarios. Part 1 in a 2-part series. The Internet enabled our global economy to take off at warp speed with increasingly interdependent supply chains. Our ability to be flexible – directing production to one part of the world while sourcing goods and services from elsewhere to optimize for quality and cost – is what sets some companies apart from their rivals. But as with most situations, it is vital to have a Plan B or Plan C just in case. As we’ve seen recently in the news, the impact of natural disasters such as fires, earthquakes, and tsunamis can have far-reaching implications beyond the epicenter when the supply of goods and services is concerned. This makes the role of procurement all the more complex for executives. There was a time in my career when colleagues in procurement emphasized cost considerations as a major factor in their decision-making. Now procurement has evolved into a more strategic business activity, focusing not only on securing the right goods at the right price, but also fostering supplier relationships, protecting the company’s brand reputation, and ultimately delivering customer satisfaction. Today’s procurement leaders have become trusted advisors to the business. Not only must they keep a watchful eye on traditional supply chain metrics and issues; they must also anticipate the impact of external forces on the sourcing of goods and services. How will shifting tariffs impact supplier agreements and costs, and will they prevent suppliers from delivering materials on time? Will geopolitical issues such as Brexit affect the cost, transport, and availability of our supplies? What is the best way to ensure that the goods we procure uphold our corporate social responsibility to use fair labor practices and safe materials? How can we make environmentally conscious choices when sourcing goods and services? How can we manage the risk of supply chain delays and compliance issues? How can we ensure transparency of transactions within the supply chain – perhaps using blockchain? How can we measure ROI instead of focusing only on cost? That’s a lot for any single organization to manage. But the stakes have never been higher. Fortunately, new intelligent technologies can help enterprises reimagine the end-to-end procurement process. Artificial intelligence, machine learning, and robotic process automation, together with design thinking sessions, are helping companies reshape their critical source-to-pay processes, collaborate with suppliers and partners, and bring new innovations to the business. Consider the possibilities. Intelligent technologies can automatically extract data – from the enterprise, its complete ecosystem, and third-party information sources such as Dun & Bradstreet, Thomson Reuters, or weather services – to detect a potential delay and suggest alternate routing or an alternate supplier. Open technology platforms are best-suited to support these innovative applications. Some platforms provide core industry-wide procurement data that can help companies understand and adopt the best practices of colleagues and competitors. Others support application programming interfaces, helping companies flexibly connect their systems, both on-premises and in the cloud. We’ll explore further in the next blog in this series with examples of how procurement professionals can use data-driven insights to drive real value. To learn more about the intelligent enterprise, listen to the Webcast series. To learn more about how technology can help enterprises reimagine their procurement processes (and more), listen to the Webcast Explore the Future of Intelligent Procurement. Part 1 in a 2-part series on model risk management in the areas of artificial intelligence and decision intelligence for the enterprise. In recent years, artificial intelligence (AI) has moved from being fodder for post-apocalyptic fiction to occasionally dystopian reality. The technology has also enabled several valuable advances in consumer services. To date, AI’s risks and benefits have remained largely limited to consumer-facing applications. And while the security and other unintended and unforeseen risks have affected many individuals and seem challenging to remediate, the causes—like cyberattacks, fake news, and privacy invasion—are increasingly well-understood. Over the last several years, however, AI and related technologies like decision intelligence (DI) have moved beyond Silicon Valley and Seattle to penetrate a new type of company: the large business enterprise. Companies like MasterCard, Grainger, Ford Motor Company, and others are looking to AI/DI for a competitive advantage. Reflecting this maturation in the market, SAP, for example, has made its launch of SAP Leonardo—specifically targeted towards machine learning in the enterprise—a strategic priority. Built on large data stores and using the latest in fast, high-quality AI methods, these enterprise initiatives by SAP and others are accelerating even more rapidly than the first wave of consumer-focused AI developments. Enterprises now perceive that, with the rise of AI-powered tools, data as a resource is on the same level as natural resources, labor, and capital as a fourth factor of production, which is thus far largely untapped (see below). The opportunities that will be unleashed are extraordinary, as AI and data will power business growth worldwide for decades to come. This is both incredibly exciting as well as a reason for great caution. Algorithms that are based on data that represent the institutional knowledge of every enterprise on earth have the power to do great harm as well as good. A big part of the reason: That data also represents institutional enterprise biases and business goals. Applications of AI/DI in the enterprise have far-reaching potential consequences: They can influence public policy, especially around digital governance and disrupt jobs, capital allocation, or employee incentives. As enterprise companies embrace AI, the potential for harm is greater than it is for consumer applications. Impacts that are initially contained within a particular enterprise can eventually emerge as macro societal consequences. Many enterprises are as large as all but the very largest nation-states in terms of control of resources, labor, and capital. The decisions they make already directly impact essentially all facets of the lives of billions of human beings. With AI, that influence will be even greater. We can “supercharge” good decisions or bad ones. Consider, for example, robotic process automation (RPA), an emerging form of business process automation where workers are replaced by AI systems for parts of a process flow. The RPA promise is that automating repetitive and well-defined processes can improve productivity, in part by removing the variable work speeds and errors intrinsic to human labor. This can produce great financial benefits for an organization. The process mapping and data cleansing that accompanies prep for RPA deployment can also pay immediate and long-term dividends. But a well-considered RPA initiative must include consideration of unintended negative consequences as well. Computers lack the ability to do more than they are told, specifically in this case to recognize an “unknown unknown” negative event happening within a process flow. By removing humans from these processes, we also remove an important checkpoint mechanism to ensure against situations that were not anticipated by process designers or in the backward-facing training data used to build the AI. The additional risk these changes introduce into automated processes must be understood and mitigated. RPA also introduces societal and social risks. What happens to people whose jobs are automated away by RPA? This question is not exclusive to RPA. Many AI systems have this same risk structure—a positive benefit that introduces a new risk internal to the organization, as well as a possible negative externality. Beginning with data risks, and moving all the way through the potential of “superhuman” robots, the risks involved in deploying AI and DI into the enterprise can be classified as shown below. Contrast the model illustrated above with the focus of IT risk management today. By and large, current models and practices focus on risks involving loss of data, whether via corruption, theft, or loss of access. These risks are increasingly well-understood. While the detection, prioritization, and mitigation of these risks are time- and resource-consuming, this is not, in essence, an opaque problem: We can understand the process and agree on our objectives. Risk management: To define a framework for quantifying risk (along with which ones will be accepted) and the roles and responsibilities involving risk within the organization. Business impact and risk analysis: To quantify the impact and likelihood of a risk and to maintain a prioritized list of risks by this net impact. Risk mitigation: To determine where risks should be mitigated and to identify risk owners to be held responsible for management of mitigation measures. Risk monitoring: To track and correct countermeasures. As applied to IT, these measures always cover at the least security administration, application change control, data backup and recovery, and the systems development lifecycle. More specific controls apply to situations like development outsourcing, use of open source software, Software-as-a-Service (SaaS), and more. What is missing from these approaches is attention to the embedded patterns in the data being protected. These patterns emerge when that data is used to build models, and then those models are used to build systems. Model risk management is in its infancy and is a focus today only for financial institutions. We have yet to develop a general model of the new kinds of risks that emerge when data is used to construct AI models. How should this data be stored, arranged, and networked? What business outcomes should be targeted? These outcomes almost certainly did not include using that data set to build an AI model. For this and many other reasons, no collection of data is a perfect model of the world. They all include biases and misalignments that can be insidious and reach far beyond the immediate business outcomes we are seeking. Each time a human interacts with the system, whether that’s a CRM agent entering client data or a marketing researcher deciding whom to call, new selection biases like this one are added. And this problem is pervasive. DNA databases are, by and large, “too white.” And medical trials are conducted much more often on men than on women. Even if data were miraculously free of hidden biases, traditional IT risk management focuses inward, on the enterprise assets, processes, economic outcomes. Few risk managers presently include broader societal impacts of business decisions in their risk assessments. With AI, it will be critical to extend the risk framework to explicitly address these externalities. In terms of the ITIL risk process map, for instance, both external (societal, ecological, etc.) risk identification and management and structural data bias identification and management are missing. How do design risks impact outcomes? Consider one example of the impact of such a structural bias. In O’Neil’s Weapons of Math Destruction, the author describes a school system that used an outside vendor to rank teacher performance. A key variable in the system was the difference in performance scores in a teacher’s classroom from one year to the next. Based on her low ranking in this system, an outstanding fifth-grade teacher named Sarah Wysocki was sacked. It was only years later that she learned that the algorithm used to score her performance did not check for potentially artificially inflated scores from previous instructors. In other words, a factor outside of the algorithm created an unintended consequence. This pattern of un-modeled outside factors pervades many stories of enterprise risk. There is no obvious single point of failure that leads to the negative outcome. That is because the outcome emerges from a chain of many decision points, and those decision points are not specifically engineered based on a well-thought-out framework. It is important to note that we cannot address the failure without understanding how those links influence the decision space. For more on this topic, see The Human Side Of Machine Learning. While all of this was going on with Amazon, Microsoft was leading the way when it comes to servers, tools, and enterprise services. As Microsoft became increasingly aware of the importance of the Cloud, they began to divert resources to the development of virtualization technology. 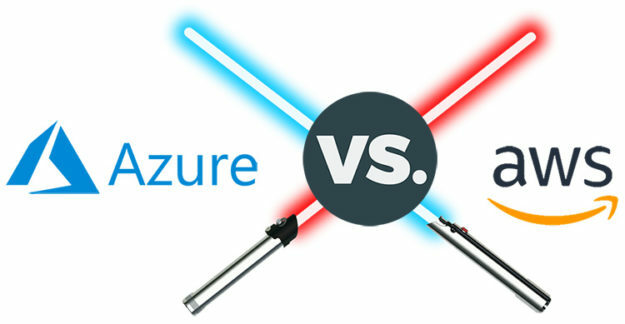 Over time, Azure was developed. At the same time, Microsoft’s Internet and Search teams were devoting time and money to developing Bing and other Internet solutions — and this has set Microsoft up to combine everything it’s developed into Azure as a Cloud computing platform with an existing enterprise-level customer base. With AWS, you can always “lift and shift” your systems to the AWS Cloud — but then your IT department is left managing that infrastructure. With Microsoft, this is taken care of for you, freeing up your IT department to pursue other tasks. The Top 10 blogs on our top 20 list are written by people well known to CRM professionals. There’s a reason for that: In order to understand and appreciate the discipline of CRM, you must be a person who values other people, and part of valuing people is being able to communicate with them. As a result, these bloggers bring a unique combination of insight and personality to their posts. They’re readable as they’re talking technology, eloquent as they explain experience, and compelling as they chronicle the customer. The criteria for consideration: You may not be a vendor (though there are good vendor blogs out there), and if you work for one your blog must be vendor-agnostic. Your primary focus must be on CRM or an area associated with CRM, and you must have posted at least seven times in the last calendar year. There’s a lot to be said about the people on this list — but their words speak for themselves. Here are the Top 10 of 2018. Bob Thompson has done an astonishing job of keeping his contributions fresh over the years. It’s not that Bob is some technology and business philosopher-king — it’s that he’s observant and unwilling to accept the status quo. For instance, in an era when businesses use the term “customer experience” in every meeting and every press release, Bob points out how poorly businesses actually are faring in attempting to deliver great CX — and then he talks about how they could do it better, and what the pitfalls are for staying with a losing game plan. Blockchain is said to be a big deal — is it? Does it actually affect customers? Will it in the future? Have you ever heard of “CXtech”? You know the technology, but Bob put that handy name on it, and then defined it as the massive category it really is. Bob can wear the IT and business hats equally well, which makes for deeper posts that don’t simply dwell on how cool technology for sales and marketing is, but also go to its implications and how it may change the way we work. Epokonic blog up several notches this year. He’s staked out a viewpoint on the CRM world — it’s not about CRM, but customer engagement and relationships, and you can’t deliver those things without a platform — and spent much of 2018 focused on the platform potentials of the large vendors, particularly Salesforce and SAP. In doing so, he makes the subtle point that CRM is not the end all of building lucrative customer relationships; you need to ensure that the sales experience and the support experience are optimal as well, and that means other parts of the sales process must be optimized with tools like configure-price-quote and contract lifecycle management. Last year, he was particularly adept at picking apart acquisitions. This year, he put acquisitions into context and had a remarkable knack for explaining what companies really were trying to do as they built their platforms. Thomas was one of the few to point out that Salesforce might be a juggernaut in CRM, but it may have a weakness in building a platform compared to other big CRM players. Is CRM becoming such a commodity that it is no longer the marquee item in a customer data management suite? Stay tuned — Thomas will let you know if it happens. A long time ago, another CRM pundit privately chided me for writing a story about a very basic CRM concept. I countered by reminding him that many people were still CRM neophytes, and that you have to get people through the lower-level courses before you get to the upper-level stuff. How to Crush Google’s New Performance Measurement Score with Your WordPress Site. The blog is written by Steve Chipman and Daryn Reif, two CRM consultants whose real jobs are probably a lot like this — explaining the basics and then putting their expertise to work on more exciting ideas once customers are up and running. The blog includes vendor comparisons and a TCO calculator, but it also touches on issues of keeping humanity in the CRM process, something that can be difficult as companies fixate on managing and employing customer data. The only way this blog could be better is if more it could feature more posts each year. Voices Carry, talking about an area that he’s specialized in the last few years: voice interfaces, a topic that includes AI, personal assistants — and CRM, of course. Brent talks a lot about the market battles between various platforms, but he’s at his best talking about the use cases for voice interfaces and how different platforms fare in those cases. For instance, Brent provided the best analysis of Salesforce’s announcements about Einstein Voice — and later, about Einstein’s integration with Siri. Talking about those developments needs to include the impact they will have on the average CRM user, and Brent has been doing CRM so long that he immediately can grasp the implications of the emergence of voice, and paint a picture of how that will change the CRM user experience. It won’t just be the CRM experience that changes — Brent already has started talking about how voice will impact related applications, ones that are “CRM-ish,” to borrow his own phrase. Like voice, this blog is only going to gain in importance in the coming year. Keep your ears open. Forrester (with related applications being handled by other analysts), and as a result their posts are authoritative and assertive in tone, and they nearly always conclude with an easy-to-digest list — or points, directives or directions. Customer Service Robots Rise Up, a post that talks about AI-equipped physical devices that actually interact with customers and merchandise — and can still have an impact on customer experience. Bruno staked out his position as the relay man between pure CRM and the applications that give it value, contributing valuable posts about configure-price-quote software in an era when big players like Salesforce and SAP have acquired products to leverage the two three-word acronymns against each other. Smart — but a little dry, as analysts are wont to be at times — Kate and John provide an educated view of what’s over the horizon, and they can back up their predictions. Sneaking back onto the list this year is Mitch Lieberman, an industry veteran with experience in nearly every role you could list with vendors, system integrators, analyst firms and as a CRM practitioner himself. Conversational Systems, his blog about technology that helps make the experience better for the customer on the other end of the conversation from the business. That does not mean he’s out of CRM. In addition to great posts analyzing investments in SugarCRM and marketing technology moves by Salesforce, Mitch is continuously tacking into the CRM wind to make sure readers don’t get confused about CRM’s importance, even as new technologies crowd core CRM out of the headlines. How Good Clean Data Helps Businesses Earn Trust in Precise Customer Conversations, which explores the hoary old topic of data hygiene in a new way. First, Mitch asks why the CRM Evolution, SpeechTek and Customer Service Conferences are held simultaneously but separately when these disciplines all influence each other in dramatic and consequential ways (I said the same thing at the closing panel of CRM Evolution in 2012, but that’s not the only reason I admire that take). Then he explains how you can’t really have impactful conversations with customers without accurate data — not just access to the data within CRM or other systems. Access to accurate data is vital if salespeople, agents, bots and marketers are going to have the conversations they need to succeed. Data is not an IT thing when Mitch talks about it. His return to the list is a most welcome one. Understanding Chatbots and Next-Generation Conversations . The CRM Consultant, which draws on two things: his extensive experience in CRM (15 years as a consultant, time before that with CRM vendors); and his engaging yet no-nonsense way of getting his ideas across. Richard (this year joined Mark Payne as a contributor to the blog) does not sit around wistfully dreaming of CRM’s glowing future. He’s a lot more interested in fixing the things broken in so many implementations that are holding back CRM’s present. It’s a pity that many may not find his blog until they’re deep into the CRM world, because his solid advice on what to do early in the consideration and implementation process could save money, aggravation and jobs. Seven Things to Consider Before Signing a CRM Contract — but if you’re in charge of the acquisition and deployment on CRM in your business, this is exactly what you need to know. Why Absolute Clarity of Purpose is So Important in Implementing CRM Systems. This isn’t a question of technology, but a question of what the business plans to do with the data it collects. Companies race into CRM implementations without articulating why, or what objectives they will be expected to accomplish. Identifying a purpose makes selection and adoption much easier, and enables businesses to understand ROI better. Basic stuff? Maybe — but it’s also frequently overlooked. Richard and Mark help remind CRM pros about the hidden-in-plain-sight things that can make and break CRM deployments, making this an indispensable asset. CRM Search are a welcome thing. Delivering the kind of deep analysis that vendors pay the analyst firms big bucks to get, Chuck strips down trends to their bare essence and then rebuilds them so readers can see exactly how those trends and their associated technologies can improve their businesses. A former CRM company CEO, Chuck wrote several posts from the perspective of wearing his chief executive’s hat, focusing on what he deemed the “Final Four Competitive Advantages” — innovation, culture, customer affinity and predictive analytics. It should come as no surprise that all four affect or are impacted by CRM — without a successful CRM process, all four can be robbed of the data they need to work. Chuck had no problem taking an issue that people wrestle with — say, “How to Measure Customer-Centricity” — and delivering a post that answers the question in a decisive way. If you’re expecting a discussion of CRM as a technology, you’ll be disappointed. It’s clear Chuck sees the technology of CRM as a mostly settled matter, and that the most important factors influencing success or failure are no longer about the software but about the leadership and process design that bind CRM into a company’s DNA. This blog refocuses the picture on what’s needed to make CRM and its associated technologies drivers of real success. This year, Paul Greenberg showed that he would have been a good editor. He recruited a lot of top talent, including numerous people who finished below him in this list, to write guest posts for Social CRM: The Conversation. That exposed his readers to a lot of important ideas explained by notable leaders in the field, but it limited the amount of Paul they got. That is a relative term, however. When Paul gets going, you need to settle in, pour yourself a nice beverage, and be prepared to read for a while. He writes lengthy posts, and you’ll need to invest a little time, but they’re written in almost the exactly the same voice in which Paul speaks — itself an uncanny writing feat, and something that makes them very enjoyable. I don’t think he’s always aware of it, but he writes on multiple levels: When he talks about a hotel that nails not just personalization but also humanization, he’s writing as the pleased customer, as the CRM academic who knows how it should work, and as the practical expert who can pinpoint what went into delighting the customer even (and maybe especially) when he IS the customer. SAP’s major pivot in 2018 is a great example of this, and it includes his hilarious five-point takedown of the brand name C/4HANA (Point 5: C4 is a plastic explosive). This is why Paul has been at the top of this list for so long: He uses relationships to build his knowledge, and he uses his knowledge to build his relationships, creating something that results in great blogs (in addition to a lot of other great things that have helped the CRM community over the years). Beagle Research blog, which leaps from subject to subject with dizzying frequency but, when taken as a whole, places CRM in a context that emphasizes how important CRM is to business and the greater world. Denis did great work analyzing the moves of the big players in 2018, wrote some insightful pieces about where CRM is going (and how well companies actually are employing CRM), and evaluated what CRM itself was in an era when the core technology simultaneously is becoming a must-have business application and a commodity. He zigs as much as he zags: Should social media be regulated? (Denis suggests they’re becoming like utilities and may need to be.) Why can’t Facebook provide its users with an acceptable degree of security if a relative fuddy-duddy like Oracle has been able to focus on it in recent years? How did the space program of the 1960s set the tone for digital transformation? How could digital currencies become the tools by which people bypass torpid government entities to fund responses and solutions to climate change? In between all of this, Denis examines the practical stuff, too, like why salespeople are finding it harder and harder to make quota and how to overcome this. Is it a lot to take in? Sure it is! But that’s the way CRM is. The minute you assume it’s merely about increasing your sales is the minute you fail to take advantage of the chain of activities it can catalyze. Companies grousing about their CRM ROI may not suffer simply from poor execution; they may also suffer from insufficient expectations about the transformative power of knowledge. Denis’ blog can serve as a barometer of how expansive your view of CRM is, both as a technology and as a discipline. That is why his blog is perched at the top of our list this year. NewVoiceMedia, and a speaker, writer and consultant. He also has written four books on World War II aviation. That didn’t happen much in 2018. Much like the core CRM world, the CRM blog world settled down. The major players stayed major; cracking the top 20 became tough — only two new entries made it in 2018. Regular, disciplined blogging leads to thoughtful, informed posts, which is how the 10 blogs below found their way to this year’s list. Some rose on the list, some fell. How did your go-to blog fare? Take a look at the list, starting with number 20. Toolbox Tech CRM Blog dropped by almost 75 percent in 2018, which left a mere 72 posts about CRM. That number of points suggests that the blog would be something of a grab bag, and it is. Reporter’s notebook-style posts, opinion pieces and news analysis elbow for position within the blog. There’s no distinct identity here; authors range from freelance journalists and tech industry execs to the cryptic “CRM Desk,” which sounds like a well-informed piece of furniture. However, the sheer volume of content means that almost any topic of value is covered here. Don’t expect it to be in-depth or particularly timely — its post about SAP’s acquisition of CallidusCloud, which was announced in January and finalized in April, ran in November — but do expect posts that will provide a firm foundation and help in learning the basics of the rapidly evolving CRM world. 19. Kerry Bodine & Co.
People in business are all about acting, doing, going and moving. Kerry Bodine & Co. (coauthored by Amelia Sizemore) is like a big stop sign for businesses. I don’t mean that it’s a destroyer of momentum, but that it’s a reminder to pause and think about what you’re doing and where you’re going before you take off, or you could be motoring into trouble. An expert on the process of journey mapping and measuring customer sentiment, Kerry also is a major advocate for the concept of businesses honestly examining what they really hope to gain from their customer experience initiatives, and whether those objectives properly sync with what the customer wants. For example, one post makes the simple but incredibly profound and frequently overlooked point that a customer journey and a customer lifecycle are two entirely different things. Treat them that way, and the customer’s going to feel it. Another post riffs off an older post about customer support and reaches a new conclusion about its impact on CX. perpetual listing of CX events that’s a really useful practical tool. If you care about CX, this blog needs to be on your reading list. Her posts aren’t essays, or musings or meditations — they’re logical arguments with supporting evidence. She doesn’t come right out and say it in her Customer Think blog posts, but her underlying theme is one of business coherence and balance — getting the proportions correct so that any one aspect of your efforts doesn’t cannibalize your other efforts. An example of that was her great post “Acquisition Addiction’s Impact on Customer Experience ROI,” which points out that there are three opposing forces at work within marketing departments: maximizing profits, maximizing revenue, and creating and keeping customers. If CX is so important, why is acquisition prioritized, lauded and rewarded? This isn’t an easy thing for a C-level executive to admit, so Lynn lays down the numbers and makes it hard to argue against her. She used this formula repeatedly in 2018, and if you pay attention you should be able to detect why companies say CX is important even while customers say CX is getting worse. Let her give you a dose of reality, then square up your CX efforts. Dr. Natalie Petouhoff’s blog in 2018 — all over the map, yes, but headed somewhere with a purpose. Ranging from flying cars to customer acquisition to the flagging power of blogs (ahem! ), she covers a ton of ground, can talk tech as easily as she can outline business concepts, and seems like she’s having a lot of fun sharing things she’s learning. With fewer guest bloggers than in 2017, there’s more Dr. Natalie in the blog in 2018 — which is a good thing. A Salesforce VP (and program executive in the Innovation and Transformation Center), she keeps the blog mostly vendor-agnostic (hey, Dreamforce is so enormous that it demands CRM blog space the way a black hole demands matter). She also offers smart takes on key issues without getting mired in the perspective of customer, business or employee — she has them in mind, but she’s able to consider all their perspectives. Easy to read, brimming with information and totally unpredictable, Dr. Natalie’s blog is a grab-bag of thought-inducing viewpoints. ScienceSoft’s team finds the time to write posts that outline the basics of CRM very concisely, providing a useful introductory-level foundation of knowledge about the technology. While there’s an emphasis on areas that the company wants to stress — Salesforce gets a lot of nuts-and-bolts attention, as does the worthy topic of customer support — the blog doesn’t feel forced or laser-focused on driving leads. That’s because the writing is clear, relaxed and readable, and best of all, well-organized. The structure is well thought out, and as a result the thoughts are well-structured. If you’re objective is to look over the horizon and imagine the next big thing, this isn’t your blog. If you want to make sure your CRM knowledge foundation is strong before expanding your capabilities, it is. Customer experience is just one part of the coverage area, which spans marketing, analytics, and the category of technology that’s been dubbed “customer data platforms” (CDP). David explains how to screen CDP vendors in this helpful post. David has a knack for getting deep into the technology and providing a spreadsheet’s worth of supporting numbers, while at the same time maintaining a sense of humor and readability. Collapse of Civilization Makes Marketers’ Jobs Harder. Raab also examined Salesforce’s efforts to pull customer data together via its Mulesoft acquisition (and subsequent announcements at Dreamforce), and Adobe’s moves in the CX and commerce spaces, and turned a skeptical eye toward hot technologies like blockchain. If you’re a CIO who works closely with sales and marketing, you need to read this blog. Raab includes detail that an IT junkie will love, and he weaves it into a business narrative that puts the technology into context — something no other blogger does so well. Nick Baggott’s CRM and Digital Marketing Blog got down in the weeds, focusing almost entirely on the digital marketing side of things. Nick talked about engagement — a fascinating and ever-changing topic when it comes to social media — and the use of tools like WhatsApp for reaching the right customer segments with the right messages. Nick squeezed in some high-quality content about the right ways to do search engine optimization. He also penned a very good piece about influencing the influencers — something many companies try to do in a half-hearted or haphazard way, but which he says is crucial to the success of a company’s social media marketing. This year, Nick’s biggest contribution was to highlight the outstanding work of others, then offer his own extra expertise on top of it. It’s a workmanlike blog, from a hard-working advocate for changing the way businesses market themselves. Duct Tape Marketing Blog continues to generate good advice for people in sales, marketing, and any other part of the buyer-seller experience. The Seven Steps to Marketing Success — How to Build a Marketing System, penned by John himself. It’s the marketing-oriented posts that keep the blog on this list; they go to the discipline of CRM rather than the technology of CRM. Posts include frequent podcasts with experts like Shep Hyken, Allen Gannett and Jantsch himself, meaning that this blog delivers its messages through more media than most. This frequent blog is part beginner’s course, part upper-level classes, and part expert advice, all rolled into one. A word that kept coming up this year on this blog, penned by Brian Carroll and others, was “empathy.” That might have sounded weird a few years ago — after all, this is B2B, not B2C! — but in 2018 it finally started to penetrate businesses’ collective minds that if you want to provide a great customer experience, you need to understand how customers feel. How they react to your business is based on their needs and preferences, not on what the business wants or what it assumes customers desire. How Sales Hustle and Automation Can Hurt Customer Experience, which nails a truth all people who are sold to know, but which most people selling (or managing salespeople) never seem to internalize while on the job. Transform Your Customer Success and Accelerate Growth, but this year showed that the team at this blog has embraced customer experience fully, and what that means. It’s not enough anymore to just close deals — you need to close deals in a way that leads to the customer’s next purchase. It’s fun watching this evolution unfold in the posts of this blog. CX Journey fell a little in quantity in 2018, but the quality increased. Her musings on CX, corporate culture and employee experience are insightful and full of actionable ideas, but perhaps the greatest value of the blog is to drive home the point that all of these very human considerations are intertwined. Employees suffering through work drudgery can never deliver a great experience, and culture sets the tone for employees. CRM and loyalty efforts are reflected through this prism. Executives can talk a big game about the importance of CX, but unless they grasp the fact that CX balances on the top of a fairly complex structure, and ensure that structure is sound, the CX talk is just talk. There are a few guest posts, but most of the time the blog is Annette’s own writing — which simultaneously can be on the long side and concise. That is a clumsy way to say there’s a lot of meat to each post. post on journey mapping should be required reading for anyone new to or confused by the topic. When you realize that the point of the blog is to drive business for her consulting company, and that there’s very little self-promotion in the posts, it becomes clear she walks her talk: Customer engagement needs to be about the customer first. This is an excellent blog that keeps getting better. What’s in Your CX Budget? Destination CRM stopped updating, which was a shame, since for years it had been a helpful reporter’s notebook-style blog that delivered consistent, high-quality content. It wasn’t flashy, but it was very effective in spotlighting influencers and people working in CRM who should be influential. Since it was written by reporters (this year, exclusively by Sam Del Rowe), there almost always was a link to any studies or research mentioned. In 2018, the blog focused a lot on customer behavior — how customers want to buy, what they’re doing online, what they like and dislike about customer service, and so on. The blog didn’t grab onto the customer experience train; it seemed a step behind, talking to the business about how it should react to customers instead of trying to get out in front of experience. This is still valuable information to learn and consider as you try to adjust your CX focus. At the Collibra Data Citizens event in May of this year, Paige Roberts had a chance to speak with Kenny Scott, a Data Management Consultant. In part one of this two part series, Roberts and Scott speak about some of the challenges that come along with being a data management consultant. Roberts: Let’s start off with an introduction of yourself for our readers. Scott: My name is Kenny Scott. I started in banking 29 years ago, in the Trustee department providing a regulatory service to large Investment companies. After a few years I moved to London, returning to Edinburgh three years later to take up a role in a newly formed Business Systems Team, working with business objects, database creation, and forming the bridge between the business and Technology teams. There was a considerable amount of diverse data, from shareholder registers to complex market derivatives data at a time when Data Governance was not as prolific a subject as it is now. Looking back with the experience I have now, there were a few practices that would definitely not be allowed in today’s data environment. After a year, I was given a data quality team to look after, because the data quality manager left. That’s when I started using Syncsort’s Trillium Data Quality software. Four and a half, five years ago. Ever since then I’ve been ensconced in Trillium software. The metadata and Trillium software were working together. They’re very complementary, as I was talking about in the presentation. What problems did you have when you arrived? What was the driver for them to hire you? It was a Data Foundation program that was in place. The company was finding it difficult to attract anyone with Data Quality experience, especially with exposure to Trillium software, they saw my CV, and thought, “well somebody knows Trillium” because that’s the tool that they had bought. They were using Trillium Data Quality software and they got training so they could produce some business insights, but they were giving figures to the business senior managers, 80% and less, 60% and less, 40% and less. Businesses don’t care, they want to know the problem. They want it written back to them in English. One of the challenges was that previous Quality Assessments could not be replicated due to a lack of documentation and process. They’ve done a huge customer analysis and it gave some great insight and narrative but nobody could tell us how they’ve cut the data, how they’ve sourced the data, how it’s been sliced, or what the rules were that they used to get to the focus. The key is that everything we do is documented with a standard operating process. Those are used every time through the process. If people find a better way of doing something, we tweak it and then make it better, but we’ve written in such a way that anyone can come in off of the street and, as soon as they have access to the data, they can do the processes. What has really been your major stumbling block in implementation? Access to data. Getting the data out of systems when nobody wants to show anything because it could pull down the system or hunker performance, even in non-production environments. That’s changing now because they see the value of what we’re doing and there’s no tax on the server. You had to explain to them that Trillium software would not mess with their performance before they would let you pull the data? Yeah, those are the problems on the data governance side which wasn’t my task. What we were doing with data quality started to give validation to what we were doing in data governance. Yes, absolutely. What we do is focus on the customer data funnel where we get people from in the business. For example, it was alluded to address line two must be kept blank. And it’s actually in the manual to leave that blank. Who leaves a critical field like address line two blank? Why do you have address line two it if you’re never going to put data in it? Exactly. [Laughter] Because you’ve got an inconsistency in your data mastering platform, you’ve got to make your algorithms more complex to harvest the data to do it. The market sector we were working in was for Agriculture and farms in the UK. You’ve got a house, a street, and a street type. You’ve effectively got a house name, a farm name, an area name, and a town. There’s no numbers in four strings and when you’re using a name and address for projects you look for numbers in the patterns. And you don’t have those patterns, you can’t find them. They’re also doing things like the address fields having name information Mister and Missus. Mr. Scott could be the first line of the address. You’ve got names and addresses all over the place. That’s why we need consistency. That thing is the biggest challenge. Actually with all of the data, I reckon that we could get 96-97% exact match to a postal address if we just structure that correctly, which is a pretty good place to be. Make sure to check part two where Roberts and Scott speak about the final stages of a data consultant project and where Scott’s next move will take him. At the Collibra Data Citizens event in May of this year, Paige Roberts had a chance to speak with Kenny Scott, a data management consultant. In part one of this two part series, Roberts and Scott spoke about some of the challenges that come along with being a data management consultant. Part two focuses on the final stages of a data consultant project and what’s next for Kenny Scott. Roberts: Going back to where you are now, what stage are you at in the implementation now? Where along the journey are you? Scott: We started off as a group day on the 1st of January this year after about 18 months as a program. We’ve engaged several parts of the business. We’re recruiting those good people to come in. The next stage is to get them in, get them trained, and do the handover. Roberts: So you’ve actually pretty much got them going. It’s just a matter of knowledge transfer and making sure that they’ve got people in-house who can continue. Scott: What I’d like to do is transition into more of a data governance role, and help with ideas and then contribute to the data strategy. IT has the data architecture space and they’ve got the access to Collibra. They do the data models and the governance part of it that we don’t need to do. They handle the data quality and the data governance for our data pool as opposed to data governance as a whole. Right. Collibra is focused on that whole top level, and Syncsort’s Trillium software is very focused on the quality aspect. All right. Well, you’re talking about winding this down and you’re doing the hand-off. What do you think you’re going to do next? At the moment I’d like to get back into a bigger organization. I’d like to get into a car manufacturer, or the utility industry, or aviation, or even maybe the medical field. I want to start looking at different datasets. Somewhere that’s big enough to be invested in the tools, somewhere with innovation, you know? The whole purpose of the technology is to solve a business problem. If you don’t focus on the business problem first, you’re kind of missing the point. That’s good. You really have to talk to each other. It’s too easy for the technology and the business half to get separated until they’re not even communicating. It was interesting to hear some of those speeches out there now, and even some of the questions that come up about technology driving the governance. I don’t see that. I see technology having a process requirement to make things efficient by knowing where their catalog is or where their assets are. That’s the driver of governance. That is putting something in that is going to help them deliver the toolsets. They’re the ones that hurt when it’s not done right. I heard somebody talk about a data quality campaign that had been done at their business, and it saved something like 600,000 pounds. They were wasting all of that money on the marketing campaigns that were never going anywhere. And that’s fair. I wanted to get to where we are, at the moment, we started to monetize for all of that returned mail. I get figures back for what it costs for returned mail, what it costs for the email campaign so we see what we don’t get back from this. And also since we have a permanent head of data coming in the next month so we can make the transfer and keep the show on the road. That transfer of knowledge, it’s like there’s a certain degree of knowing what they’re supposed to be doing, and how it’s supposed to work, and you need to move that. Well, thank you for taking the time to speak with me and I really enjoyed your presentation today. Security can be one of the most complex issues to contend with when managing a SQL Server instance, yet it’s also one of the most important, especially when sensitive and personal data are on the line. In fact, for many organizations, security is their number one priority, which should come as no surprise, given what’s at stake. Fortunately, SQL Server includes a variety of tools for protecting data from theft, destruction, and other types of malicious behavior. In this article, the first in a series about SQL Server security, I introduce you to many of these tools, with the goal of providing you with an overview of the options available for safeguarding your data. In subsequent articles, I’ll dig deeper into the different technologies, providing a more in-depth look at how they work and what it takes to protect a SQL Server instance. Protecting data starts with the ability to authenticate users and authorize their access to specific data. To this end, SQL Server includes an authentication mechanism for verifying the identities of users trying to connect to a SQL Server instance, as well as an authorization mechanism that determines which data resources that authorized users can access and what actions they can take. Authentication and authorization are achieved in SQL Server through a combination of security principals, securables, and permissions. Before I get into these, however, it’s important to note that SQL Server supports two authentication modes: Windows Authentication, sometimes referred to as integrated security, and SQL Server and Windows Authentication, sometimes referred to as mixed mode. 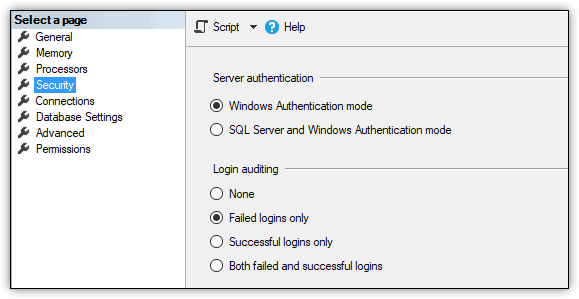 Windows authentication is integrated with Windows user and group accounts, making it possible to use a local or domain Windows account to log into SQL Server. When a Windows user connects to a SQL Server instance, the database engine validates the login credentials against the Windows principal token, eliminating the need for separate SQL Server credentials. Microsoft recommends that you use Windows Authentication whenever possible. You can specify the authentication mode when setting up a SQL Server instance or change it after implementation through the server’s properties, as shown in Figure 1. At the heart of the authentication and authorization mechanisms are the principals, securables, and permissions that must be configured to enable users to access the data they need, while preventing unauthorized users from accessing data they shouldn’t. You can view and work with principals, securables, and permissions through SQL Server Management Studio (SSMS), using either the built-in GUI tools or the available T-SQL statements. Figure 2 shows Object Explorer in SSMS with the expanded Security folder for the WideWorldImporters database and, below that, the expanded Security folder for the SQL Server instance. A login is an individual user account for logging into the SQL Server instance. A login can be a local or domain Windows account or a SQL Server account. You can assign server-level permissions to a login, such as granting a user the ability to create databases or logins. A server role is a group of users that share a common set of server-level permissions. SQL Server supports fixed server roles and user-defined server roles. You can assign logins to a fixed server role, but you cannot change its permissions. You can do both with a user-defined server role. A database user is an individual user account for logging into a specific database. The database user commonly maps to a corresponding server login in order to provide access to the SQL Server instance as well as the data itself. However, you can create database users that are independent of any logins, which can be useful for developing and testing data-driven applications, as well as for implementing contained databases. A database role is a group of users that share a common set of database-level permissions. As with server roles, SQL Server supports both fixed and user-defined database roles. Server-level securables include databases as well as objects such as logins, server roles, and availability groups. Database-level securables include schemas as well as objects such as database users, database roles, and full-text catalogs. Schema-level securables include objects such as tables, views, functions, and stored procedures. Permissions define the level of access permitted to principals on specific securables. You can grant or deny permissions to securables at the server, database, or schema level. The permissions you grant at a higher level of the hierarchy can also apply to the children objects, unless you specifically override the permissions at the lower level. For example, if you grant the SELECT permission to the user1 principal on the Sales schema in the WideWorldImporters database, the user will be able to query all table data in that schema. However, if you then deny the SELECT permission on the Sales.Customers table, the user will not be able to query that table, but will still be able to access the other tables in that schema. You can use SSMS or T-SQL to view the permissions that have been explicitly granted to a user on a securable. For example, Figure 3 shows the permissions granted to the user2 principal on the Sales.Customers table. In this case, the user has been granted the DELETE, INSERT, SELECT and UPDATE permissions, with no permissions explicitly denied. Configuring permissions for multiple principles on multiple securables can be a complex and sometimes frustrating process. If you don’t get it right, you could end up denying permissions to users who should have access to specific data or, worse still, granting access to users who should not. The safest bet is to follow the principles of least privilege, working at the most granular level practical for a given situation. SQL Server also provides several other features for controlling access to data. For example, you can implement row-level security on a specific table by creating a security policy that calls one or more predicates. A security policy defines the structure necessary to apply row-level security to a table. A predicate is a table-value function that provides the logic necessary to determine which rows the security policy applies to. A security policy supports two types of predicates: filter and block. A filter predicate filters the rows available to read operations, and a block predicate blocks write operations that violate the predicate. You can include both filter and block predicates within a security policy, and you can call the same or different predicate functions within that policy. For example, the WideWorldImporters database includes the FilterCustomersBySalesTerritoryRole security policy, which defines both a filter predicate and block predicate. Figure 4 shows the security policy as it is listed in Object Explorer, along with the policy definition. In this case, both the filter predicate and block predicate call the DetermineCustomerAccess function, which determines which rows the current user can access. Another SQL Server security feature is the application role, which is similar to the database role, except that it is used specifically to assign permissions to an application. However, unlike database roles, application roles do not contain members. In addition, they’re invoked only when an application connects to SQL Server and calls the sp_setapprole system stored procedure, passing in the name of the application role and password. SQL Server enforces the permissions granted to the application role for the duration of the connection. Another access mechanism that SQL Server provides is the credential, a server-level object (record) that contains authentication information such as a username and password. The credential makes it possible for a SQL Server user to connect to a resource outside of the SQL Server environment. For example, you can use a credential to run an external assembly or to access domain resources if you’ve logged in using SQL Server Authentication. Also important to SQL Server security are the encryption capabilities built into the database engine. Encryption provides a way to encode—or obfuscate—data so that only authorized users can view the data in an unencrypted state. To everyone else, the encrypted data looks like gibberish. Encryption is not an access-control mechanism, that is, it does not prevent unauthorized users from accessing data. However, encryption can limit the exposure of sensitive data should unauthorized users manage to break through SQL Server’s access-control defenses. For example, if cybercriminals acquire encrypted credit card information from a database, they will not be able to make sense of that data unless they’ve also figured out a way to decrypt it. SQL Server supports several approaches to encryption to accommodate different types of data and workloads. For example, you can encrypt data at the column level by taking advantage of SQL Server’s built-in encryption hierarchy and key management infrastructure. Under this model, each layer encrypts the layer below it, using a layered architecture made up of a public key certificate and several symmetric keys. In this way, the column data is always protected until it is specifically decrypted. 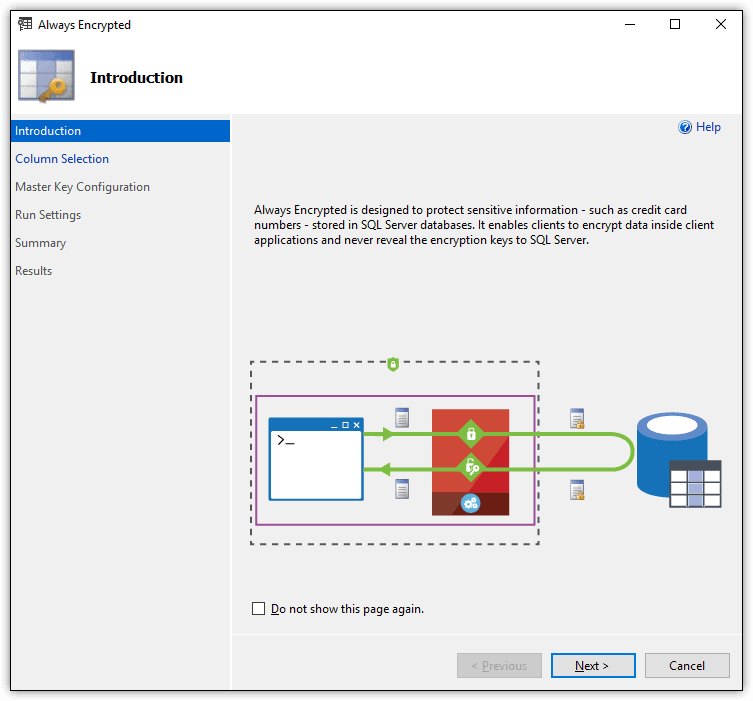 Another tool available to SQL Server is Transparent Data Encryption (TDE), which encrypts and decrypts both data and log files in real-time, working at the page level to ensure that data at-rest is protected. The database engine encrypts the pages before writing them to disk and decrypts them when reading the pages into memory. Unlike column-level encryption, an application does not have to take specific steps to decrypt the data. The entire process occurs behind the scenes. SQL Server also supports the Always Encrypted feature, which makes it possible for a client application to handle the actual encryption operations, without the encryption keys being revealed to the database engine. However, to implement Always Encrypted, you must first generate the column encryption keys necessary to support Always Encrypted. To do so, you can use the Always Encrypted wizard in SSMS, as shown in Figure 5. Once the columns have been encrypted, the data is ready for client access. However, for a client application to connect to encrypted data, it must incorporate a driver that is enabled for Always Encrypted and can handle the encryption and decryption operations. Another useful SQL Server security feature is Dynamic Data Masking (DDM), a tool for masking all or part of data values. Although DDM doesn’t actually encrypt the data, it does limit the amount of exposed data to non-authorized users. For example, you can use DDM to mask all but the last four digits of a credit card number or national identifier such as a social security number. SQL Server includes a number of other tools to help protect data and limit risks. For example, you can use SQL Server Configuration Manager to configure startup or connection options, or use the sp_configure stored procedure to configure global SQL Server settings. 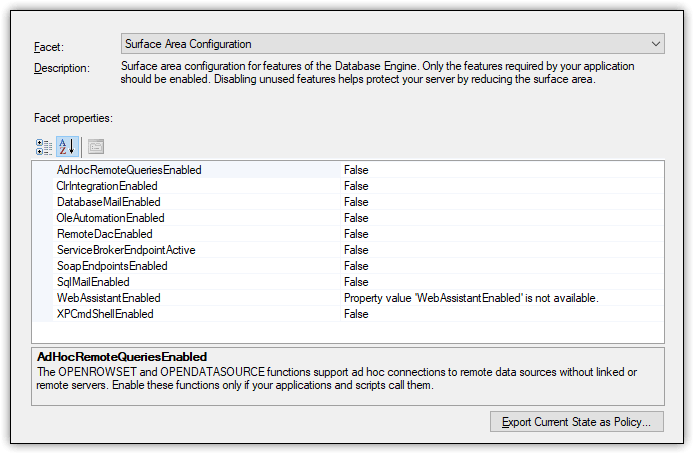 SQL Server also provides the Surface Area Configuration facets for enabling or disabling features at the instance level, as shown in Figure 6. You can use these tools to ensure that only those features essential to supporting your users and applications are enabled at any given time, helping to reduce the exposed surface area and consequently the level of risk. SQL Server also provides tools for identifying potential database issues. For instance, SQL Server provides the TRUSTWORTHY property as one of its database properties. The property shows whether the current SQL Server instance can trust the database and its contents. In addition, SSMS provides the Data Discovery & Classification feature for classifying, labeling, and reporting on potentially sensitive data in a database, as well as the SQL Vulnerability Assessment (SVA) tool for discovering, tracking, and addressing potential database vulnerabilities. Figure 7 shows the results of running an SVA assessment against the WideWorldImporters database in SQL Server 2017. One of the most valuable SQL Server security tools is SQL Server Audit, which provides a structure for tracking and logging events that occur within the database engine. 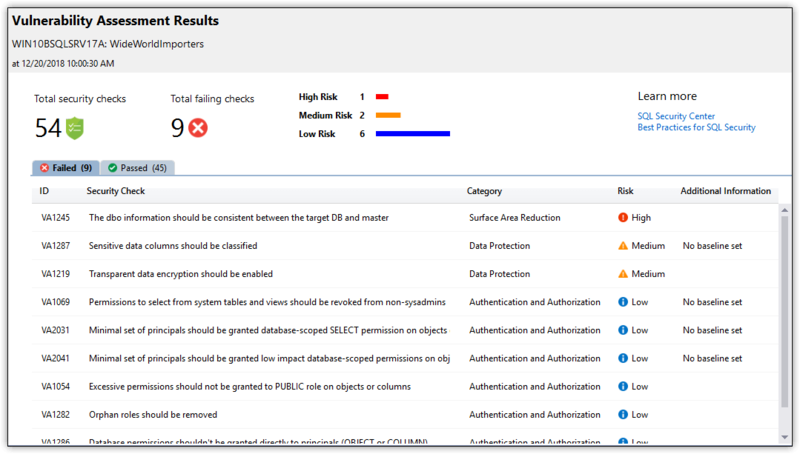 With SQL Server Audit, you can monitor events at the server level, database level, or both. SQL Server Audit comprises three primary component types. The first is the audit object, which provides a structure for carrying out the auditing process. The audit object defines a target for the audited events. The target can be log files, the Application log, or the Security log. The audit object also includes configuration settings such as the number and size of the log files. In addition to the audit object, an audit usually includes a server audit specification, a database audit specification for each applicable database, or a combination of any of these. The specifications determine which events should be audited at the server level or database level. For example, Figure 8 shows a database audit specification that audits UPDATE and DELETE events on the Sales.Customers table. In this case, both events are specific to the user1 database user. If the user tries to update or delete data in the Customers table, SQL Server Audit will log the event to the target repository. Along with all these tools, SQL Server also provides a number of catalog views and dynamic management views for accessing security-related data. For example, you can retrieve details about the permissions granted and denied to a specific database user. In addition to taking steps within SQL Server to protect data, DBAs should also be certain to implement protections related to the SQL Server instance as a whole, such as disabling unused SQL Server components, applying security patches and service packs in a timely manner, and ensuring that database and backup files are fully protected and secure at all times. But a protection strategy should not be limited only to SQL Server. The host operating system should also be kept up-to-date and properly patched, with just as much attention paid to surface area reduction. In addition, DBAs and IT administrators must ensure that the host server is physically protected and that network safeguards such as firewalls and intrusion detection are in place. A SQL Server instance must be both physically and logically protected to achieve the maximum security. Development teams must also ensure that the applications connecting to a SQL Server instance are properly vetted for security issues. A data-driven application is at risk for a number of attacks, including connection string injections, elevation of privileges, and SQL injections. The teams should factor in data security from the start, when first designing the application, not after it’s been implemented. SQL Server security is a huge topic, and what I’ve covered here barely skims that surface. You should view this article as only a starting point, meant to alert you to the many security considerations to take into account and the different SQL Server tools available for protecting data. As this series progresses, I’ll dig deeper into the various security components, fleshing out what I’ve covered here and introducing you to concepts I’ve yet to explore. In the meantime, I recommend you learn as much about SQL Server security as possible, beginning with Microsoft’s own documentation.